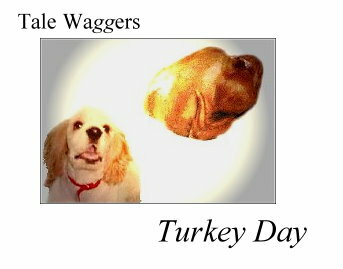 Tale Waggers - TURKEY DAY! Where will we hide it? Hours of tantalizing smells torture their canine souls. For the dogs, Thanksgiving is almost a religious experience. The plots begin at dawn, when the huge carcass is prepared for its final journey. They’ve ogled it before - inside its chilly berth in the refrigerator, but now it has come out to play. For many years now, our Thanksgiving turkeys have been christened "Elmo". The name sprang from an incident involving a too large turkey, a too small oven - and a small, yet spectacular, blaze. As I extinguished the blazing breastbone, I was reminded of Saint Elmo’s Fire and the image (and the name) stuck. Eventually, dog hopes are dashed as the beast is wrestled onto the roasting pan and stuffed into the oven. Those of us who were not busy making scads of money in the 1980s remember the adoring, worshipful stares. Mrs. Reagan would sit beside her husband, eyes upward - as if toward heaven. All that rapt attention never looked quite natural. The reason for this is that, while she may have introduced this behavior to humankind, it did not originate with her. It originated when a clever wolf decided the humans might just toss some food his way. Dogs can tell you what the oldest profession is - it's begging. Now all our guests sit at the table with "Nancy eyes" upon them. The uninitiated and the weak fall victim to the oldest trick in the book. Food goes from plate - to lap - to dog. Tradition has won out once again. The quick, the hopeful, and the stupid always make some sort of play for the dishes left unattended. A canine is always caught mere inches from a cranberry sauce smear or a gray spill. Nothing ever comes of it, but still they press on. Next morning, Papa is having his traditional breakfast of turkey sandwiches. The bits return. This "festival of the bits" goes on for nearly a week - until even the dogs are sick of turkey. One day when the sky is gray and there’s a winter chill in the air, it will come again.